Yesterday seven of us had a lovely afternoon sipping Mint Juleps (virgin ones) and savoring shrimp and grits; broccoli and cheese quiches; cornbread with brie, apple and mushroom ‘bacon’; tea sandwiches and an endless array of desserts. We bantered about southern expressions with our best southern accents, as best as Yankees can do Dixie. It was great fun. The hardest part of acting Southern was drawling slowly. We are just at a very fast pace up here in the North and kept having to remind ourselves, and each other, to slow down. The food was heavenly. I made many things that I had never attempted before and some I had never eaten before. Everyone loved and thoroughly enjoyed the meal. 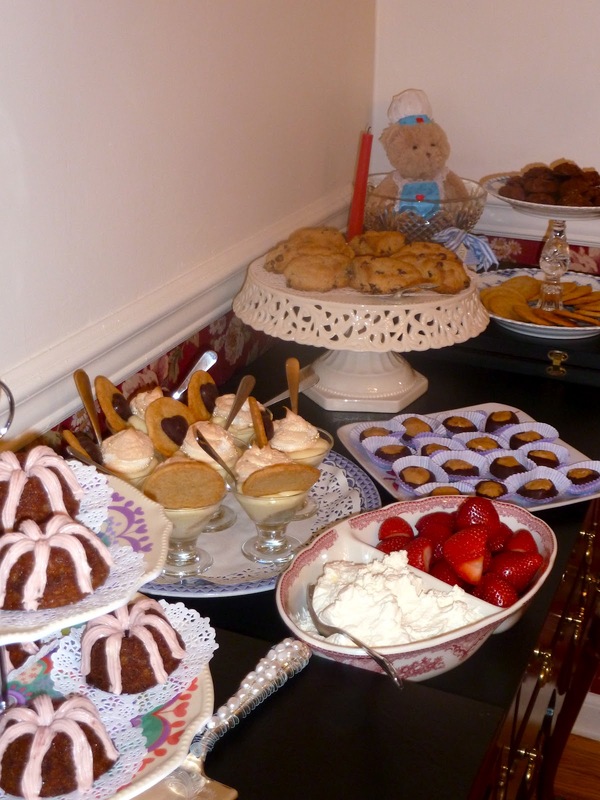 I spent a few weeks reading Southern Cookbooks from the library and then created a menu for the Tea Party from the recipes that seemed typically southern and yummy. I sort of adapted the Southern recipes to a Northern palate. I will be posting the recipes over the next few weeks. On this post I will give directions for making the pink sugar ‘cubes’. For dessert I made mini strawberry cakes with strawberry frosting; banana pudding with homemade vanilla wafers; orange chocolate chip scones; chocolate brownie cookies; buckeyes; and strawberries with whipped cream. Again, I went overboard a tad with the sweets and no one could even try them all. Doggie bags for all! My friends made Mint Juleps, Jungle Juleps and Roasted Chestnuts (from the garden). None of us had ever had a Mint Julep before. They are really good! No wonder they are popular in the South. Quite refreshing on a hot day! Jungle Juleps, from Disney World, are made from passion fruit, orange juice and mangos. These are also very good on hot days. I will get the recipes for these from my friend and post them. We also had an assortment of hot teas. We ate indoors and later sat out on the deck, I mean verandah, and sipped teas and laughed and talked (always with Southern accents). We decided that the next Tea will be a Russian Tea. My head is already churning with ideas: blintzes, borscht, caviar, hot tea in glasses….. I sure enough hope that y’all enjoy and try my Southern Tea Recipes. Of course, if you do not want the cubes pink, just add plain water. Mix water and food coloring into sugar and press this mixture into candy molds or ice cube trays with small holes. Allow to dry for 24 hours before you unmold them and then allow the cubes to dry completely for a day or two. Sugar mixed with water and food coloring. Sugar pressed into a candy mold. SUGAR CUBES Ingredients ¼ cup Sugar ½ tsp. Water with Red Food Coloring added to it. (I use India brand natural food dyes that are made with vegetables and fruits. The red dye comes from beets.) Of course, if you don’t want the cubes pink, use plain water. Directions Mix water into sugar and press this mixture into candy molds or ice cube trays with small holes. Allow to dry for 24 hours before you unmold them and then allow the cubes to dry completely for a day or two. Store in an airtight container.